Buy works – Dobuzhinsky Mstislav Valerianovich | (1875, Novgorod – 1957, New York). Dobuzhinsky Mstislav Valerianovich (1875, Novgorod – 1957, New York). He studied in St. Petersburg at the Drawing School of the Promotion of Arts Society (1884–1885), later in Munich under A. Aschbe (1899–1901) and in Nagybanya (Austria-Hungary) under Simon Hollosy; in 1901, he studied xylography and printmaking under Basil Matthee. From 1902 on, Dobuzhinsky was an active member of World of Art. He lived in St. Petersburg, 1918 to 1919 in Vitebsk, 1924 to 1926 and 1929 to 1938 in Kaunas, 1926 to 1929 in Paris, 1938 to 1939 in London, from 1939 on mostly in New York. An adherent of art nouveau and Symbolism, he turned to historical subjects and painted portraits. In 1910s, he drew and cartooned for magazines such as Zolotoye runo, Mir iskusstva, Zhupel, Apollon, Satirikon, etc. Also, he worked in the field of book illustration, making pictures for Fyodor Dostoyevsky’s White Nights (1923) and Yury Olesha’s Three Fat Men (1925). An outstanding scene-designer, he worked for the Moscow Art Theater, Serge Diaguilev, the Leningrad Bolshoy Drama Theater, the Metropolitan Opera (New York), and many other theaters and film studios. His theatrical scenery and costumery represented an intermediate link between art nouveau and avant-garde. His memoirs were published in New York in 1976, in Moscow in 1987. 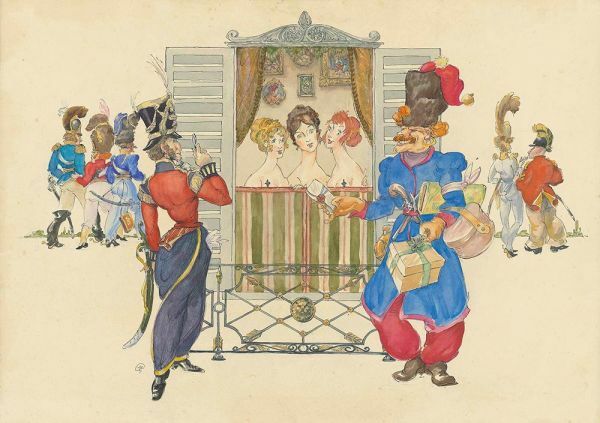 Sketch for the theatrical production of The Cossacks troops M.I.Platova in Paris: Three girls at the window. Technique – Watercolor, gouache and pencil on paper. The costume design for Tchaikovsky`s Eugene Onegin staged at the Kaunas National Opera Theater (Lithuania). 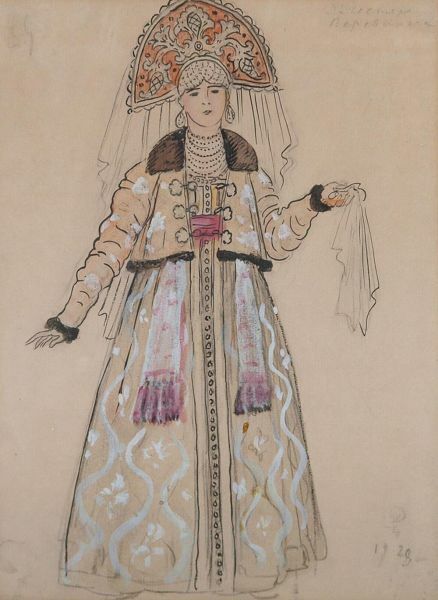 Costume design for the production "Boris Godunov": Boyarynia. Costume design for the production "Boris Godunov". Gentleman. 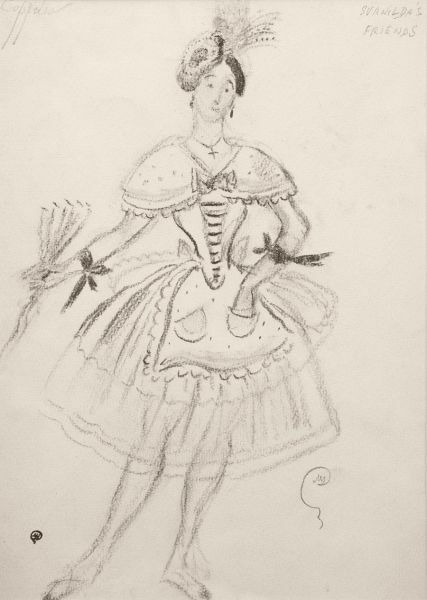 Sketch of costumes for ballet "Coppelia". Costume design for opera "Eugeniy Onegin" by P.I.Chaykovskiy. Technique: Watercolour, gouache on paper. Swanilda's friends. Sketch of costumes for ballet "Coppelia". Guests. Comic characters of La traviata parody, which was put by the artist in French "Theatre de la Chauve-Souris de Balieff" in 1926. Technique: Ink and lead pencil on paper. Sailing ships at ancor in the bay. Design for the stage set. Costume design. Woman in east dress. Costume design. A woman in a blue dress. Technique: Paper on the pasteboard, water-colour, ink, colour pencils. 45000 - 75000 rub. 45000 - 75000 rub. Design for the ballet "Polovtsian Dances". Technique: Paper, water-colour, gouache, pencil. Costume design for the production "Boris Godunov":Fedor. Technique: Paper on the pasteboard, water-colour, ink, pencil. Technique: Paper, water-colour, ink, pencil.